This was very helpful! I’m excited to implement these strategies, but I can’t find the worksheets. I feel silly – I’m sure they’re in an obvious place. Do you mind pointing out where I can download them? Wow Kim–you really let it fly this time out! I love it ! Thanks so much for all this lush info. Once again you have demonstrated these principles in your own blog. You know your potential clients are trying to be better marketeers and need “how to” specifics and you give them to us in abundance. We greatly appreciate it. 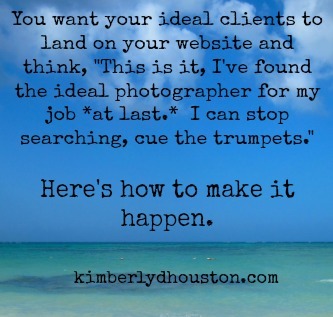 Relating to this topic, I’ve always had one major stumbling block: Who is my ideal client? Whoever likes my art and can afford to buy it is the usual answer. Historically, my clients come from all walks of life and demographics. How do I find that “target audience”? All great marketing depends on figuring this out as you stated but I’m stumped.